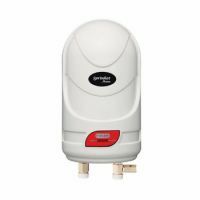 This v-guard instant water heater comes with an outer cover made of rust proof ABS material. This water heater uses hi-tech thermostat and its thermal cutout turns it off, when there water temperature over-exceeds the set limit, providing you safety. It has can withstand pressure up to 3.5Kg/cm2. The inner tank made of 304 grade stainless steel makes it an ideal device for your home. To Recieve updates and possible rewards for V-Guard Sprinhot 3 Ltr (3000 Watts) please sign in. To Recieve updates and possible rewards for Geyser/Water Heater please sign in.